Warriors: They won the season series, 3-1. … They’ve won 10 of 11 against the Lakers, including the last five in LA. … G/F Andre Iguodala (left toe soreness) sat out. … C Andrew Bogut and G Shaun Livingston rested on the front end of a back-to-back set. … Thompson (20,252) moved past Wilt Chamberlain (20,231) into eighth on the team’s all-time minutes list. Lakers: F Kyle Kuzma (left foot peroneal tendinitis) missed his third straight game. 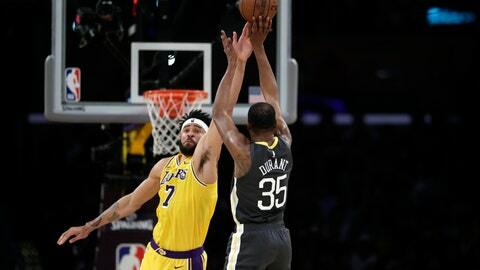 Walton said it’s not been decided whether Kuzma will sit out the last three games of the season. … Already shut down for the season is LeBron James, Lonzo Ball, Josh Hart and Brandon Ingram. … James wore a black T-shirt with the likeness of late rapper Nipsey Hussle under his suit jacket.